On Thursday 13th June 2013, The Conference “The Common Denominators– Collaboration of Cross-Region on E-Government Application, Cloud Computing and Security” was held at the Sukosol Hotel, Bangkok, Thailand. This conference was organised on the occasion in which large number international experts and companies took part in. 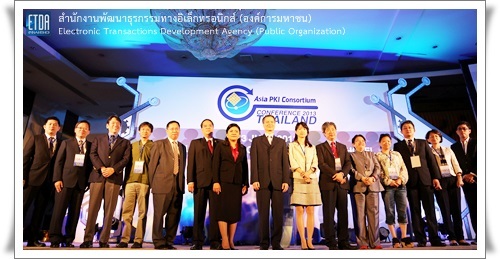 The Ministry of ICT of Thailand and Asia PKI Consortium (APKIC) were the hosts. The organiser of the event was Electronic Transaction Development Agency (ETDA) of Thailand, Business Case/Application Working Group (BAWG) of APKIC and Thailand PKI Association. Mr.Charamporn Jotikasthira, President of the Stock Exchange of Thailand and Chairman of ETDA Executive Board of Directors; along with Ms Suranghana Wayuparb, Chairperson of Thailand PKI Association & Vice Chair of APKIC, Executive Director and CEO of ETDA; APKIC Chairman Mr.Philip Leung and Leader of BAWG Ms.Karen Chang inaugurated the event. We are pleased to offer downloads of conference presentations below. What’s new? What remains? What do we need to be aware?